Tori Spelling is a talented actress and author as well as a wife and mother of four. Not only does she have the time for house, wife and motherly duties, but she makes time to host a show on TLC called "Craft Wars" in conjunction with having her own reality show with her family. 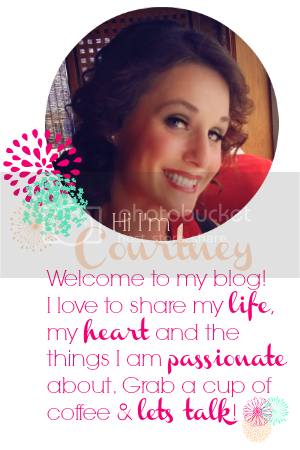 She writes about her crafting expertise and offers tips and tricks in her books and blog, ediTORIal. She might have gotten her craft roots from her parents — they have three different gift wrapping rooms in their home alone! She threw an over-the-top birthday Mad-Hatter party for her daughter Hattie, who turned one. Yes, that's right. For her 1 year old. 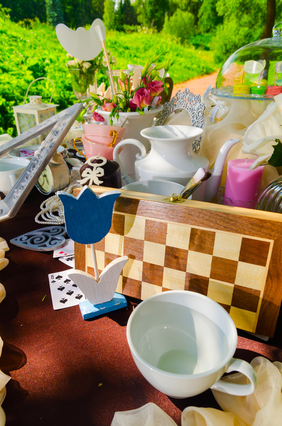 Now that we have that out of our systems, know that you can throw a budget-friendly Mad-Hatter party. Details are the most important factor in any birthday-party theme. As Tori says, "Love is in the details." Cut the wood into a large card and use the painters tape to tape shapes and numbers on the cards. Paint inside the tape and wait for it to dry. Now you have a large, attention-grabbing accent piece for your party that didn't cost much at all. Hang some large playing cards from trees. Punch holes in the cards and attach them with some fishing wire or any other type of yarn. Hang from trees, ceilings or any other place you can think of. Tori, her husband, children and dog all dressed like characters from "Alice in Wonderland." Sites like www.BuyCostumes.com have over 60 wonderland-themed costumes, so you don't have to worry about making a DIY costume. Find a variety of glass bottles at the dollar store, craft store and thrift store. Take some cardstock paper and attach it to the bottle and label them "Eat Me" and "Drink Me." Fill the bottles with a variety of candies and beverages. Once the party is over you can even recycle the bottles by placing fresh flowers inside or saving them for a later craft. What's a Mad-Hatter party without a bunch of clocks? Search all over for these fun, circular clocks. You can often find them in the home furnishings section of department stores. If not, visit a hobby or craft store. Buy as much as you want and decorate the whole party area with them. Keep three to four clocks together as centerpieces and around the venue. Photo courtesy of Wikimedia Commons user Matteo Ianeselli. If you have an abundance of furniture, place pieces outside and use it as the party decor. You can usually find cost-effective old couches and chairs at stores like Goodwill and The Salvation Army. If you have the time, slip on a slip cover (or reupholsters the whole piece if you feel up to it). If finding a variety of furniture seems too expensive, take all the chairs from your home and place them around the party. Mismatched chairs will add to the party. Like Disneyland and the movie, string paper lanterns in a variety of colors about the food and present tables. These can be found pretty cheap online and will be even cheaper if bought in bulk. Known by her friends as the DIY diva, Michelle is always coming up with new and creative ways to decorate on a limited budget. This post is a guest post and may include sponsored text links. Tori also has a regular column on crafts in Redbook magazine! OMG! That's my dream party! That I am! I've been thinking about doing a tea party idea for a while!